On June 26th Germans celebrated the sixtieth anniversary of "Operation Vittles" a.k.a the Berlin Airlift. 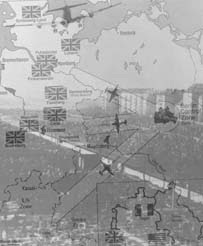 When the Soviet Union blockaded West Berlin the U.S. and Britain began an airlift to supply food and fuel… Eleven months, 278,000 flights and 2.3 million tons of food later history had been made and the Soviet Union threw in the towel. From this effort emerged many great stories and heroes, such as “Onkel Wackelflügel" (“Uncle Wiggly Wings” a.k.a. Gail Halvorsen) and the other “candy bombers.” Read the linked stories! Retired Col. Gail Halvorsen Berlin Airlift "Candy Bomber"
Who (or what) is responsible for high oil prices? Swiss police to the rescue?! ?